Wikipedia is swamp of delights. A swamp, for one may enter therein to dally, and get sucked into its twists and byways with no hope of escape. From the Wikimedia main page an incautious trackpad click allowed me to satisfy my curiousity to see what Wiki life might look like in Welsh, or Cymraeg as the language knows itself. Pretty cool, even making allowances for sad failure of the vowel harvest in the Brecon Beacons yet again. But then I noticed the slight nod in the direction of those of us not conversant Celtically, in the form of a paragraph in English which told me that Cymraeg is spoken in the west part of Britain known as Wales, and in the Chubut Vallet in Patagonia, the site of a Welsh colonial emigration in the 1860s. Which led me to the (English language) Wikipedia entry on the Welsh Argentine, wherein I learned a bit of history, and the fact that between 1500 and 5000 descendents of 19th century Welsh immigrants still speak their ancestral tongue. I also uncovered this last, truly wonderful fact: it is as a result of this history that those Londoners who hunger to move their bodies to the beat of the Argentine Tango, find one of the best venues available to them at the Welsh Centre there. What a glorious weave of history to be traced through, and all first glimpsed in four or five clicks through cyberspace. 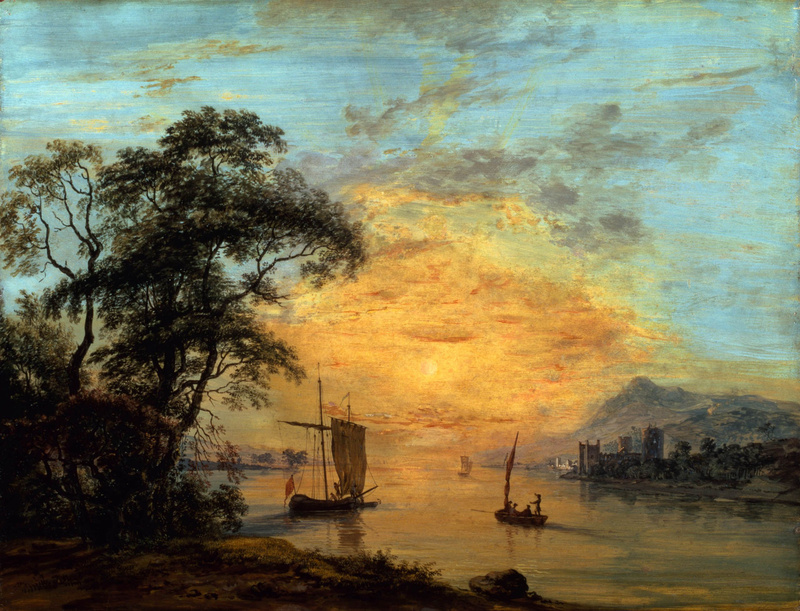 Image: Paul Sandby, “A Welsh Sunset River Landscape,” c. 1775-1800. This entry was posted on September 30, 2009 at 1:21 pm and is filed under Brain bubbles, History. You can subscribe via RSS 2.0 feed to this post's comments. You can comment below, or link to this permanent URL from your own site. but it didn’t tell you that it’s only spoken by about 20% of those that live there and not all of them are native speakers many having learnt the language as a second (or third etc.) language! Bruce Chatwin’s In Patagonia has some interesting ancedotes about the Argentine Welsh. Thony C: and so what? A friend of mine gave me the autobiography of Ray Milland, the Welsh star of Lost Weekend and The Thing With Two Heads, with Rosey Grier. Anyway, in his reminiscences, he recalls the annual appearance of the “Basque” onion sellers as a harbinger of spring. Milland didn’t speak Welsh, but the housekeeper did, and she always managed to eke out a dialogue with them, which he found quite remarkable. Through the magic of Wikipedia, I found out Galicia, in Northern Spain, is the home of a large Celtic contingent that migrated there in umpty-ump B.C. Much like the Catalan, their language and culture were suppressed during Franco’s reign, but once he became dead, it came out of the shadows.